Money laundering is a prevalent form of criminal behavior that is often conducted through corporate activities or securities transactions. It is done to hide the source or the end use of illegally-obtained money. These types of SEC whistleblower cases can be hard to detect, as the actual transactions being used to “launder” the money are usually legal, or appear to be legal, and therefore often do not raise compliance or fraud concerns upon initial examination. Nonetheless, when these “legal” activities are conducted with the intent to launder “illegal” money, they are serious frauds that are actively investigated by the SEC and by criminal authorities. If potential SEC whistleblowers believe that they have information about a public company or securities firm that is engaging in money laundering activity, or allowing others to launder money through their institutions, they can report it to the SEC as an SEC whistleblower case through the SEC whistleblower program. 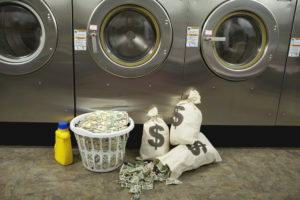 Laundering money facilitates the underlying crimes, like drug dealing or organized crime, by “cleaning” the illegal gains from those activities. By hiding or obscuring their paper trail, the perpetrators are then able to use and spend their illicit profits while avoiding detection by law enforcement. There are many ways in which transgressors attempt to launder money. Money laundering can be as simple as engaging in “cash” transactions to avoid detection and tracking. Larger amounts of illegal profits are often laundered through more complex schemes, such as corporate transactions, securities trades, or other investments. In order to combat money laundering, the U.S. Government has instituted specific compliance and reporting rules that U.S. companies, financial firms and banks must follow. These rules and regulations are commonly known as Anti-Money Laundering (“AML”) Compliance rules. maintain “Know Your Customer” files on all customers to show that the customers have been properly identified. Designation of Exempt Person Reports. The SEC takes compliance with the AML requirements seriously. Money laundering facilitates the underlying crime and enables the perpetrators to “get away with it”. But it also affects the fair flow of capital and undermines the public’s confidence in the fairness and stability of the securities and banking markets. The amount of money involved is not determinative of whether the SEC can or will bring an SEC whistleblower case based on the AML rules and requirements. In fact, the Commission can bring SEC whistleblower cases against financial or securities firms for violating the AML rules, or not providing the required AML reports, even when there is no evidence that any money was actually laundered. SEC charges firm with thousands of suspicious activity report violations. The SEC’s first stand-alone case for failure to file suspicious activity reports (SARs). SEC fines Miami broker-dealer for violating AML regulations.